Besides Abrahamson, justices tending to side with donor attorneys were Annette Ziegler, who took in $8,300 from attorneys with cases that came before the court; Patience Roggensack, who accepted $7,966; Ann Walsh Bradley, with $3,260; and David Prosser, who took in just $225. Justice Michael Gableman, who accepted $2,350 from such attorneys, did not make that list, having sided with his donors’ clients in exactly half of four cases. The remaining justice on the seven-member court, Patrick Crooks, was not included in the Center’s analysis. Crooks, who ran unopposed and took in very little money in his 2006 election, was not required to file electronic campaign finance records. Abrahamson chose to remain involved in two cases argued by personal injury lawyer William Cannon, a colleague of Mark Thomsen who made four donations totaling $7,000 to Abrahamson’s 2009 campaign. Two of Cannon’s cases, a product liability case and a medical malpractice suit, were decided by the court after he donated the money. Attorneys working with Cannon on the cases, including Thomsen, contributed an additional $21,150 to Abrahamson. Justice Roggensack, often seen as a member of the court’s conservative bloc, offered a more diplomatic critique of the Center’s findings. “It makes the court sound bought and paid for, and I don’t think that’s why the contributions come in,” Roggensack said in an interview. Roggensack sided with her attorney donors 57 percent of the time. She said she insulated herself from campaign activities and asked a staffer to inform her of larger contributions when they were relevant to a pending case. “If I had a $10,000 contribution from a person whose case was pending before me, I wouldn’t sit on that case,” Roggensack said. 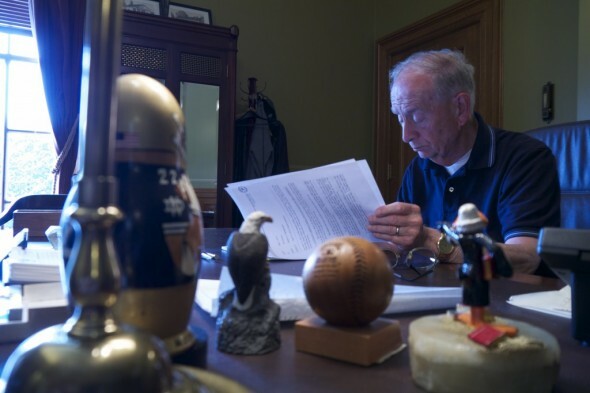 Butler, the former state Supreme Court justice, said that justices were not likely to be influenced by money. “You decide a case based on your view of the law, whatever that might be,” he said. 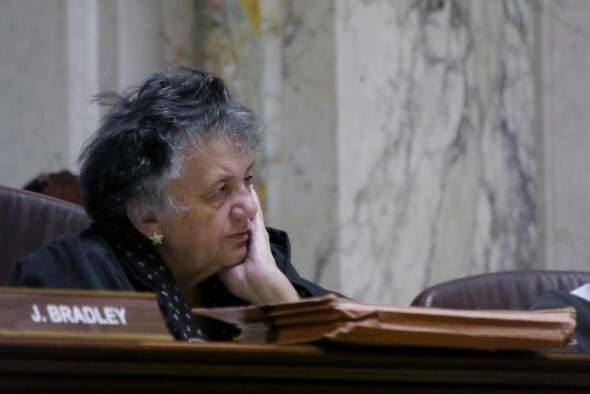 Wisconsin’s justices have faced concerns over their relationships with attorneys before. In 2011, Gableman cast a deciding vote in two cases being argued by attorneys from Michael Best & Friedrich, a firm that had represented Gableman for free in a 2008 ethics case. The same year, Prosser was criticized for planning to participate in a case involving the Troupis Law Office, which helped handle Prosser’s recount effort in the 2011 election. He eventually withdrew. Another bill would require judges or justices to state in writing the reasons for not disqualifying themselves if asked to do so. The bills are similar to legislation Hebl introduced in the 2011-12 session, which did not receive a public hearing. But critics, including Hebl and McCabe, contend that public financing for judicial campaigns would better address the issue. This appears to be a lost cause: The legislature dismantled Wisconsin’s 33-year-old public financing system following the 2011 election. But such contributions are central to the ongoing debate over judicial recusal in Wisconsin — and across the nation. Of the $22.3 million spent on the five Supreme Court elections since 2005, about a third went directly to campaigns, according to estimates from the Wisconsin Democracy Campaign. The rest came into the process as independent expenditures or “issue ads” by outside groups, such as the Greater Wisconsin Committee and Wisconsin Manufacturers & Commerce. The U.S. Supreme Court, in the 2009 case Caperton v. Massey, ruled that a West Virginia state supreme court justice should have bowed out, having received $3 million in campaign support from Massey Coal Co.’s CEO and president. Instead, the justice voted to overturn a $50 million verdict against the company. “In all the circumstances of this case, due process requires recusal,” the U.S. high court held. In 2008, the League of Women Voters of Wisconsin asked the state’s Supreme Court to adopt a standard requiring recusal in any case involving a contributor of $1,000 or more. Crooks said he would like the Legislature to create an objective standard forcing recusal whenever a reasonable person might perceive a problem. Roggensack opposes changing the state’s standards for recusal, warning that adopting a mandatory disqualification rule could have an unintended consequence. “If a thousand dollars was the limit, you could give that amount to all the justices you don’t want on the case,” she said. Jay Heck, executive director of Common Cause Wisconsin, found that scenario implausible. “Theoretically, an alligator could crawl out of my ear. It just doesn’t happen in the real world,” said Heck, whose non-partisan group has long pushed for public financing of judicial campaigns. Heck supports the thousand-dollar limit, not because a contribution “necessarily influences the justice, but it’s the public perception,” he said. Polling suggests that the public is indeed concerned about the effect of campaign contributions in the judiciary. A survey performed in 2008 for Justice at Stake, a national coalition that advocates for fair and impartial courts, found that just 5 percent of Wisconsin residents believed campaign contributions had no influence on judges. And a 2009 USA TODAY/Gallup Poll found that 90 percent of those surveyed believed judges should withdraw from cases involving campaign donors. This project was supported by The Joyce Foundation. The nonprofit Wisconsin Center for Investigative Journalism (www.WisconsinWatch.org) collaborates with Wisconsin Public Radio, Wisconsin Public Television, other news media and the UW-Madison School of Journalism and Mass Communication.